We all know that losing a bunch of keys would be upsetting and frustrating. 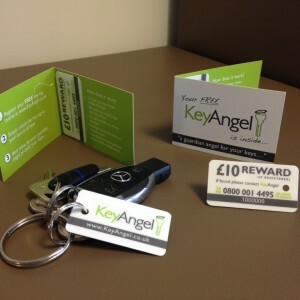 Now you can enjoy peace of mind thanks to your very own guardian angel looking out for you and your keys. Our key tag system is a simple and cost effective way of dramatically increasing the chances of your lost keys being returned to you. By attaching the key tag to your keyring, the finder is incentivised to call our Freefone number or log them on our website. Each key tag is uniquely numbered so that we can safely and securely match them to your membership account. Your details are kept safe and secure, as this service is completely confidential. Money Back Guarantee! We offer a 30-day, no quibble guarantee. 100% of your money back if you’re not completely satisfied.